With winter behind us, we’re turning our tastes to flavours that are inviting and fresh, maintaining just a hint of comfort to complement the spring season. Our chefs have put together a menu rich in the season’s best produce like spring vegetables and fish at its peak including yellowfin tuna and leather jacket. Spring is the perfect time to come and take advantage of our al fresco eating areas at Kirribilli and Crows Nest, or the harbour views and breeze at Manly. Whether it’s a relaxed lunch or an evening meal, each of our three Garfish restaurants has something new on offer this spring. Below is a summary of some of our spring feature dishes not to be missed from each restaurant. With zucchini flowers in peak season, this entree is a spring favourite. Chopped king prawns and white fish mousse are bound together with the zucchini flowers and aromatic spices such as tarragon. Covered in an aged beer batter the flowers are lightly crisp fried and served with lemon aioli which offers a creamy round flavour to the dish, then complimented with the sharper herb flavours delivered by the parsley, anchovies and capers in the salsa verde. A perfect start to your springtime meal at Kirribilli. The chefs at Kirribilli have created a surprising spring entree with their own unique interpretation of the classic niçoise salad. Traditionally served with tuna, we’ve used atlantic salmon which is cured for two days in a blend of sugar, salt and coriander seeds. Upon serving, the salmon is lightly seared, then sliced into portions. Eggs are also a staple of this dish, but we’ve done something different to the soft poached eggs and deep fried them to create a crumbed texture which complements the smoothness of the fish and potatoes. The finishing touch is the red wine viniagrette paired with the sharper flavours of basil and anchovies. It’s an elegant spring dish suited to a relaxed light lunch. Fish lovers will be satisfied with this flavoursome whole baby barramundi on offer for main. Adopting an Asian style, the barramundi is crisp fried and then dusted in crispy shallots and coriander, and served with bok choy. The chilli caramel sauce combines caramelised palm sugar with fresh chillis and fish sauce. It’s sweet and spicy and we think you’ll agree it makes this dish hard to resist. Yes, this dessert is as good as it sounds! It’s a simple, old-fashioned preparation of shortcrust pastry filled with treacle, almond meal, eggs, cream and butter. It’s both comforting and sweet, bridging the cooler weather of winter and warmer weather of summer. This entree is a raw, fresh and vibrant dish suited to welcoming in the warmer weather. The atlantic salmon is cured for two days in salt, sugar, juniper berries and Hendrick’s gin. Upon serving, it’s sliced and served with an elegant sweet and sour beetroot puree. Pickled cucumber and finely sliced red radish add to the freshness of this dish. This fish curry is a prepared in the traditional phanaeng style and unlike a lot of curries, coconut milk does not feature in this dish. Instead, authentic, aromatic and fragrant hot spices are key elements, as are the spanish makeral this main is served with, which is currently in season. This main meat dish is both fragrant and sweet. De-boned lamb shoulder is rubbed with spices of coriander, parsley and cumin that make up the chermoula, then roasted and braised. We serve the lamb with the best spring vegetables on offer including baby carrots and parsnips, which are sauteed in butter and honey. These complimentary flavours bring out the sweetness of the lamb and create a meat dish that is satisfying without being heavy. Simplicity is the key to this light, elegant dessert. Pureed rhubard is mixed with cream, and flavoured with rosewater, then served with pomegranate molasses and a ginger wafer. The molasses brings out the rhubard and rosewater flavours while the ginger heightens the taste of this dessert adding a subtle texture. 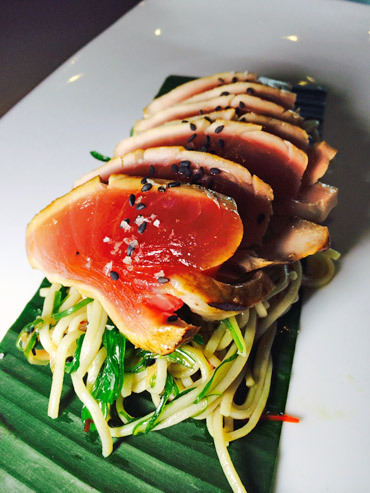 Yellowfin tuna is a stand out this season and it’s the hero of this Asian inspired entree. The tuna is seared on each side but still served raw, accompanied by a seaweed salad incorporating mirin and sesame seeds. Served on a bed of steamed soba noodles and ponzu, which is a soy sauce with a citrus zest, we think you’ll agree this main is worth trying at least once this spring. Another noteworthy entree at Manly this spring is our smoked fish and prawn croquettes. Smoked white fish is combined with chopped king prawns and a bechemel style sauce, then formed into the croquettes. Crumbed and then deep fried the croquettes are accompanied by a celeriac remoulade which incorporates mustard seed and mayonnaise. The grapefruit segments provide an elegant finish and subtly cut through the range of flavours this dish offers. Leather jacket is often considered an under achiever in the fish world but we think you’ll agree there’s nothing ordinary about the flavours this spring dish delivers. The leather jacket which is currently in prime season is given a subtle smoky, woody taste thanks to our wood roasting oven. 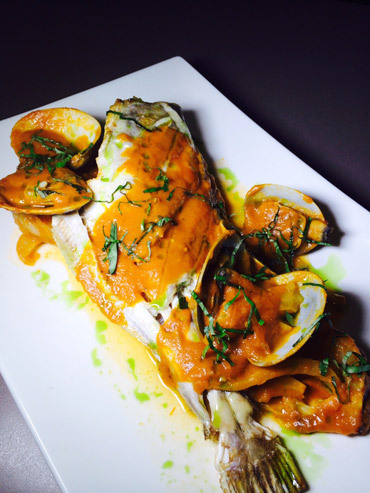 The braised tomato sauce offers a richness and thickness, particularly when accompanied by the fennel and surf clams, yet it remains light and subtle in flavour ideally suited to the texture of this whole white fish. This dessert is an old-fashioned home style pudding incorporating eggs, flour, butter and sugar with coconut and passionfruit, served hot. A cooling complimentary ice cream is mixed through with the added texture of toasted coconut. The result is a pudding that offers comfort, but is light and fresh, and well-suited to the spring evenings. Our spring menus are currently available at all three of our Garfish restaurants and we look forward to seeing you this season.